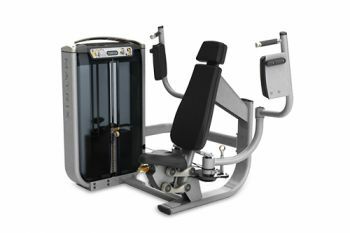 This pectoral fly machine is an attractive option for those looking for an easy to use strength training machine. By moving your hands forward, horizontally, it will help you to tone your fan-shaped chest muscles known as pectoralis major. This equipment rotates arms accommodating users of all sizes and improves their range of motions. The angled user position and the contoured elbow pads also enhance comfort and stabilisation. You can also track your progress using the electronic counter which displays repetitions, exercise time and rest time.